I wanted to post this before Christmas, but when I didn't get to it, I realized that it could be quite timely with New Year's Eve parties coming up and using up the leftover turkey. These are great little appetizers that can be made ahead, frozen and heated when you need them. We love them served with a little dollop of salsa! I got this recipe from my friend Herta, whom I talked to today, and she laughed when I told her I still make these every Christmas! I think she's probably found some wonderful new recipes I have yet to find out about. =) But when it comes to our family . . . well there are some traditions you just don't change! Divide mixture between tortillas, spread evenly and roll up tightly. Wrap and chill at least 2 hours. Bake at 350 F for 12 - 20 minutes, until you can see the cheese bubble slightly on top. 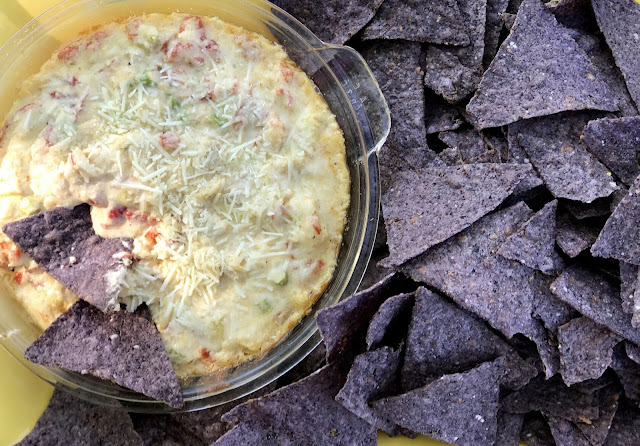 Serve with salsa. You will find the ends kind of "loose", but I fix those slices by filling in with other ends ... they'll never know once they're baked. Enjoy! In our home we prefer homemade dressings to bottled. I like to know what ingredients are put into my food and try to avoid ingredients that I can't pronounce. This is a lightly sweet and tangy dressing all at the same time. My oldest daughter signature dressing that she often makes. We really enjoy it. Shake all ingredients together in a well sealed jar until it thickens and everything is emulisfied. Keeps in the refridgerator for a week or two. Have I got a recipe for you! A few weeks back, I was visiting In a Garden...who was sharing her version of Starbuck's Cranberry Bliss bars. Truth be told, I had never tried this Starbuck's holiday treat but they looked most delicious, so I just had to check them out for myself. We had friends coming over for coffee last night and I happened to have all the ingredients on hand...so here is my version. They are rather rich but most delightful! Make cake by beating butter and sugar together until smooth. Add eggs, vanilla, ginger and salt and beat well. Gradually mix in flour until smooth. Dice cranberries. Add 3/4 cup cranberries and white chocolate chunks to batter; fold in. Pour batter into a well-greased 9" x 13" baking pan...spread evenly. Bake for 35 minutes or until cake is lightly browned on the edges. Allow to cool. Make frosting by combining cream cheese, icing sugar, lemon juice and vanilla in a medium bowl with electric mixer until smooth. Frost cooled cake, using spatula to spread evenly. Whisk together 1/2 cup icing sugar, 1 tablespoon milk, and shortening. 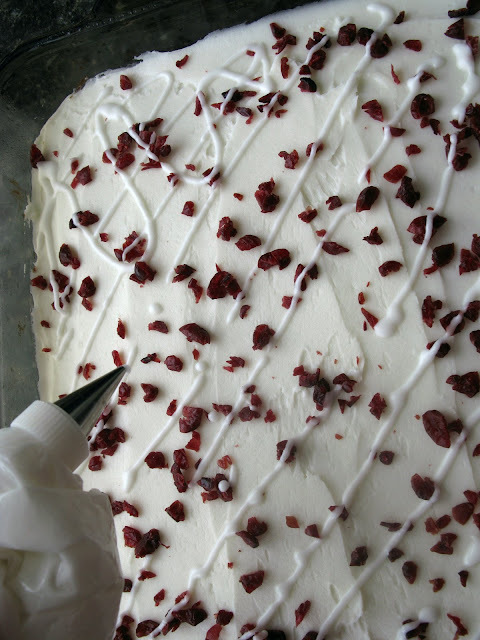 Drizzle icing over cranberries. I used a pastry bag with a fine tip. Allow cake to sit for several hours before slicing. Slice the cake lengthwise through the middle; then cut across three times, making a total of eight rectangle slices. Slice each of these pieces in half diagonally. 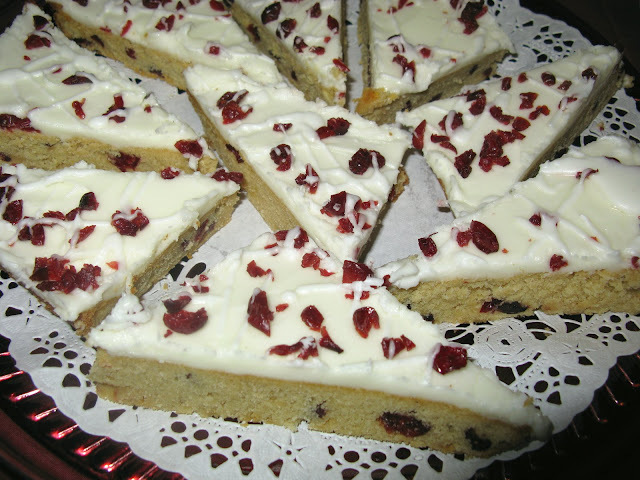 Yield: 16 generous, yummy slices of cranberry bliss. I've posted this recipe before on my blog .. .but since this is a Mennonite Recipe blog, it must be transferred over here. 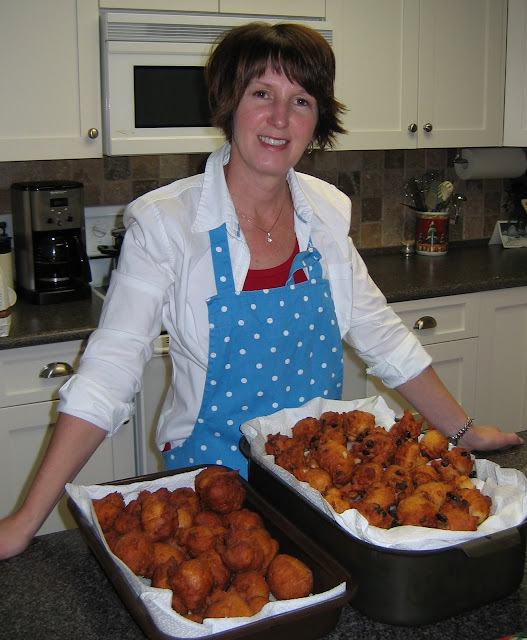 I trust that a few more Portzelky recipes that are a yearly favorite in some of the other Mennonite homes from the women on this blog will follow. I decided to post it before New Years Day so that you could see what you needed and avoid a last minute rush to the market. Portzelky (Terry's Grandma's Recipe) pronounced . . .
Stir the yeast, warm water, and sugar together slightly and let rest 10 minutes. Stir this together very well. Start to stir in the flour. You'll need 7 cups. This will make a fairly stiff batter. Cover this up with plastic wrap or a lid and let rise until it's doubled in bulk, about 1 hour. Drop by tablespoons into hot, deep fat ( I Use Canola oil) and fry until golden brown. Now this can be a bit tricky. If the fat is not hot enough they will soak up too much fat and that is not good. If the fat is too hot they will brown too quickly and still be doughy in the middle. It's a good idea to throw some bread cubes in first to see how they fry. After all these years I still usually have to throw out the first one or two. It's a good idea to stick in a toothpick to the middle of the Portzelky every once in a while to make sure it comes out clean. When you take them out of the oil, put them on some paper towel to sop up the oil. It has become tradition in my family to call together all my Geschwister (siblings) and their families to have a bowl of soup, and some Portzelky on New Years Day. This has become our Christmas gathering. This has been a family tradition for many a year now and the brunch crowd just keeps getting bigger. It really is an easy and delicious recipe. This recipe comes from a Safeway cookbook called "The Easy Gourmet". Serve with steamed asparagus and a fresh fruit salad. This recipe serves four. I however used 5 dozen eggs and two dozen English muffins to feed our crowd. Even the pickiest eaters had more than two helpings. Bring a large pot of water to a boil and reduce the heat to a gentle simmer. One at a time, break the eggs and slip then into the water, Cook the eggs for 4-5 minutes. 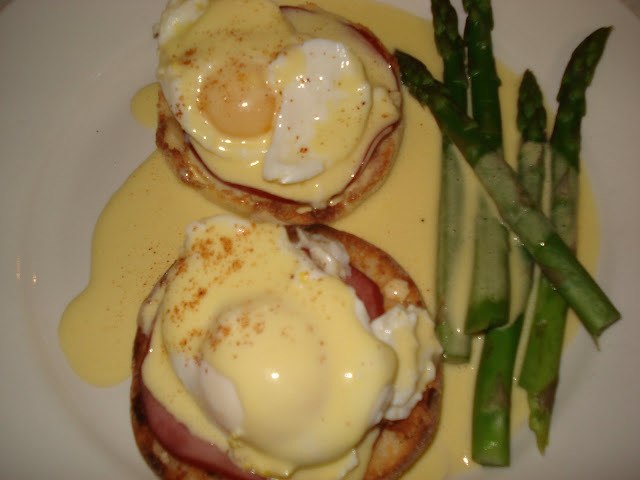 Place the eggs on top of a toasted english muffin with a slice of back bacon or ham. Top with the following Hollandiase sauce. 1/2 c. butter melting and bubbling hot. Mix together in a blender the egg yolks, lemon juice and seasoning. With the machine running, slowly pour in the butter. Run the machine a little longer until the sauce thickens. Spoon it over the eggs and serve any extra sauce on the side. In a double boiler over simmering water, melt butter, add cream, dry mustard and salt. In a seperate bowl temper the eggs with some of the warm cream mixture and add eggs to the remaining warm mixture and stir and cook until thickened. Also a very tasty sauce as well. Here is just a tiny glimpse of what you will see in our home on Christmas Eve. The Hazelnut Roll has been a favorite in our home for many years. It came from a long time acquaintance who could not eat flour. So she shared this dessert with us and it was voted a keeper in our home. It does take some time and patience, therefore when I set out do this task, I make sure I have a morning free and I always make two rolls. Do not try to babysit in between. Do not double the recipe. Make them individually. Take it straight out of the freezer and serve it. Grease 15x10 cookie sheet. Line with parchment paper and grease again. Using a mixer, beat sugar and egg yolks on high speed for 5 minutes. Beat in extracts. Beat one more minute. In a separate bowl add ground hazelnuts, baking powder, and salt. Mix well with fork. Combine hazelnut mixture with sugar mixture. Beat for 2 more minutes. Beat egg whites till stiff, but not dry. 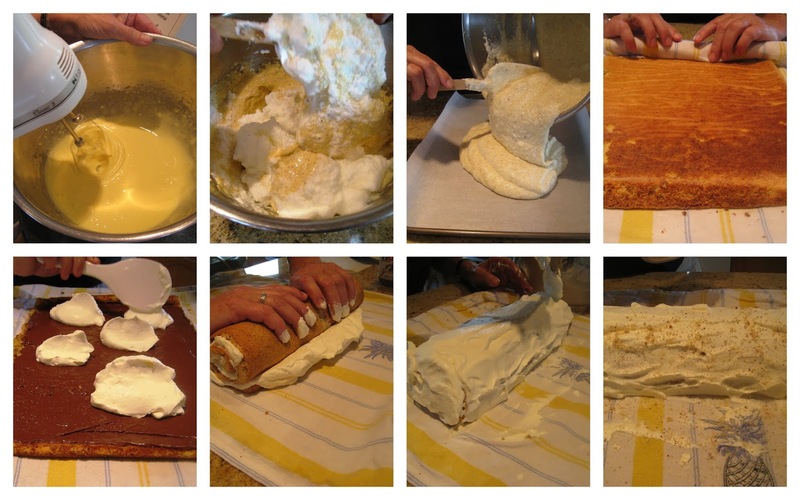 Fold egg whites into the cake batter by hand. Spread batter in prepared pan. Bake for 20 -25 minutes. Flip cake onto a damp cold tea towel, sprinkled with icing sugar, to prevent the cake from sticking. Roll up the cake and let cool for 15-30 minutes. Unroll and trim off crusty edges if necessary. 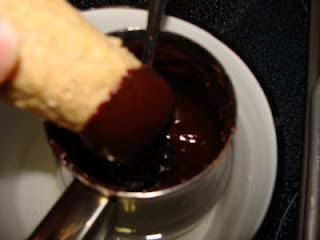 Spread with a layer of chocolate hazelnut spread. I use Nutella. Then add a layer of whipped cream. I add a stabilizer to the whipped cream. It should be stiffly whipped, otherwise, it is too difficult to roll up. Roll up the cake once more and garnish with additional cream and hazelnuts. Freeze the hazelnut roll on a cookie sheet for several hours until hard; then wrap with plastic wrap and seal it in a plastic bag. Have fun and enjoy the treat! If you can't figure it out, stop by and I will serve you a piece with freshly roasted coffee. I am a mother, wife, and Oma. How did I get here this quickly. I have been a woman of the country. We live in the most beautiful part of the Fraser Valley. My husband is a farmer and now and then you'll find me out there with him, but most times I'm in the kitchen creating some kind of event, or I'm caught planning another adventure. 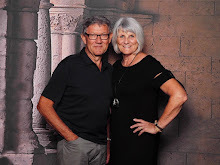 We have three children, and two lovely grandsons. I really like a good cream pie. Cream pie with a fresh flaky crust just has the perfect texture combination for me. Here is a link to Dorothy's Pie Crust. 1 2/3 cup (400 ml) unsweetened coconut milk... give the can a good shake. This can all be done in a saucepan over medium heat but I like the non-scorch proof method of a microwave. In a large measuring cup or another large glass microwave safe bowl, combine the sugar, and the coconut milk. In a small bowl, combine the cornstarch with the milk until no lumps remain. Add to the coconut milk and sugar mixture. Put into microwave and heat on high speed for 2 minutes at a time, then stirring and continuing until it is bubbly. Put the egg yolks into a small bowl, and add a little bit of the hot milk, stir, and add a little bit more of the hot milk. . .continue stirring vigorously. 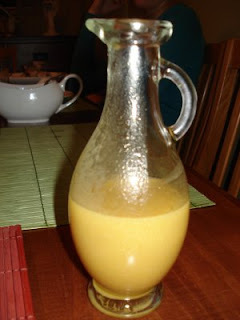 This will keep the egg yolks from becoming scrambled eggs. Pour the egg mixture back into the large bowl with the remaining hot milk mixture. Heat again in the microwave until thickened and bubbly. Total time is usually around 10 minutes for me. Add the vanilla and the coconut and the butter and stir until combined. Pour the hot filling into the cooled pie shell and cover with plastic wrap. 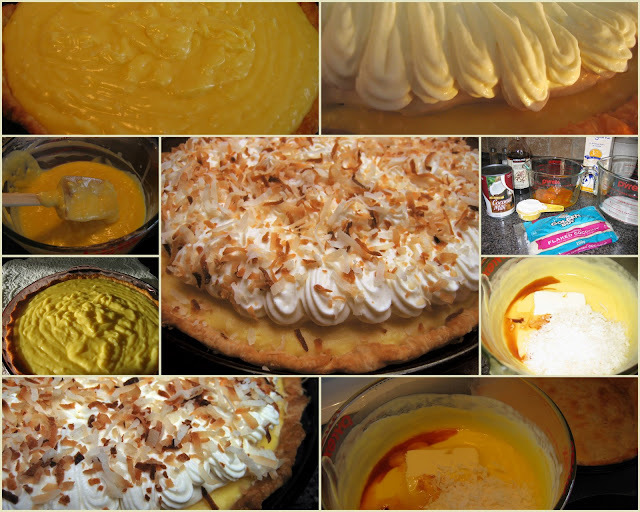 Chill the pie completely for a few hours and then dollop the whipped cream on. If you want toasted coconut for garnish, put a little coconut on foil and put into the oven at 325 until lightly toasted. This is my mother in law's recipe. I used to make them for Christmas but now my daughter Brenda makes them. She was so kind as to send me this photo and allow me to share it here. These are great to pack in a small festive tin, add a ribbon and surprise someone with a delicious treat. Mix together peanut butter, icing sugar, butter, rice crispies, and peanuts in a bowl. Refrigerate for 30 minutes. Roll into approximately 1 inch balls. Place on pan and freeze. 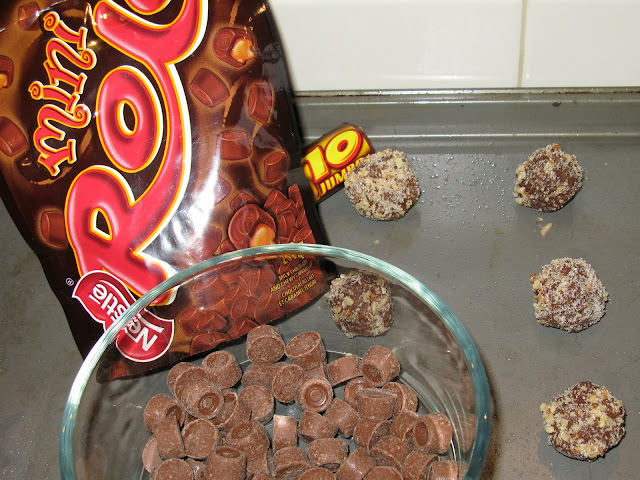 Keep melted chocolate in a bowl over hot water while dipping frozen peanut butter balls. Place them on a parchment lined pan without touching until firm. It seems there is always a green bean casserole at the holiday table, most often using Campbell's cream of mushroom soup as the sauce. This is a slightly different variation, one which we prefer. Stir in flour and cook over medium heat about 1 minute. Add milk and cook until thickened, while whisking. Stir in salt, sugar, pepper, onions, and sour cream; heat through. Add green beans, mushrooms and water chestnuts; stir to coat. Spread cheese over top and sprinkle with french-fried onions. Bake at 350 degrees for 30 minutes or until bubbly. If the casserole has been refrigerated, allow about 30 minutes more cooking time. Put this appetizer out on your kitchen island and for sure you'll have everyone right where you're trying to finish up the meal. My son-in-law loves to tease me about that! So, depending on how stressed you want to be, plan your placement carefully. If I remember right, I got this recipe from my niece, Pauline. Spoon into 9 inch pie plate or similar small, low baking dish. Bake at 350° F 10 - 12 min. Serve with crackers, corn chips, guacamole or black bean chips. This recipe was from my Mom's friend Esther Moore. Her and her husband John were our pastor couple when I was growing up in Victoria. He was a musician as well and afew of his songs are published in church Hymnals. One of my favorites of his is Burdens are Lifted at Calvary. These cookies are easy, and they melt in your mouth. Whip together butter and sugar. Add 2 cups of flour and continue to add flour until dough comes together in a soft ball. It will be soft but manageable to roll out on a floured counter. Roll out to 1/4 " thick and cut with cookie cutters. Leave plain or decorate with colored sugar sprinkles. Bake @ 325 for 12 minutes. Let rest on pan for one minute and remove to a cooling rack. With the cold crisp dry air we have been having I decided to make Pavlova since it turns out the very best when the air is dry. This is one of the easiest desserts to make if you can beat an egg, and whip some cream you can do this. Prepare your baking sheet first. Lay down a strip of parchment paper or waxed paper on your cookie sheet. Lay a luncheon sized plate down in the center and trace around it. It will enlarge to fit on a dinner sized plate. Beat your egg whites and cream of tartar in a large bowl with a stand mixer or a hand mixer until soft peaks form. Combine the vinegar and the cornstarch in a small bowl. Add to the egg white while you are beating. Add vanilla and beat until very stiff. You should be able to turn your bowl upside down. Spread the egg whites onto the parchment paper, just to the edges of your tracing. Bake for an hour. Open up the oven and have a peek. The meringue should feel dry and no longer soft. If need be, leave it in another 10 minutes and check. Leave the meringue in the oven and turn it off. Leave in until completely cooled. Beat 2 cups of whipping cream and spread over top the meringue just before serving. Slice kiwi and put pomegranate seeds on top for a Christmas dessert or strawberries and kiwi or whatever is pretty and in season. I'm not sure who gave me this recipe but I used to make them for the children's school lunches. They would also be great as appetizers for those Christmas parties. If you have a food processor, use it for the pastry. You will need to make the recipe twice to use up the filling. 4 envelopes beef bouillon powder. Cheddar cheese cut into pieces about 1/4 inch x 1 inch x 1/1/2 inches. Brown ground beef and onions until meat is cooked through. Drain fat. Set aside to cool while you make the pastry. Place all pastry ingredients in bowl of food processor and pulse until dough begins to stick together. 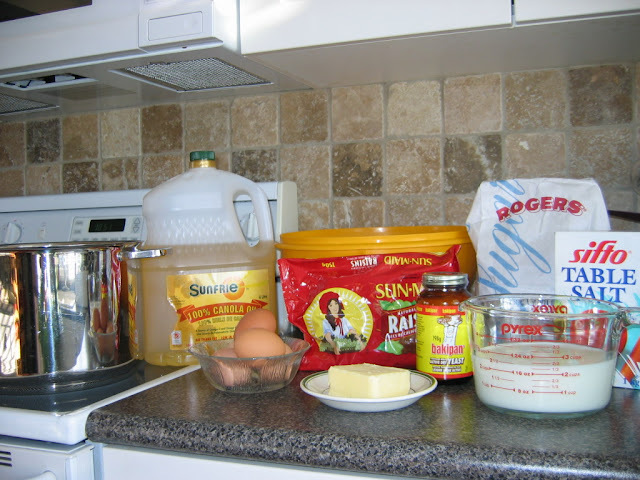 If mixing by hand, cut margarine and cottage cheese into dry ingredients and then mix by hand until mixture holds together and becomes somewhat sticky. 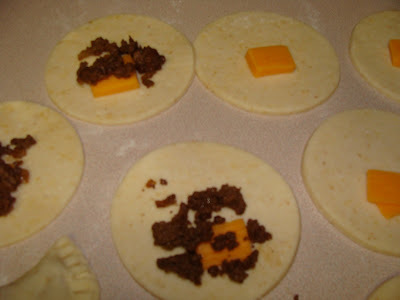 Divide dough and roll each piece out to about 1/8th inch thickness on floured surface. Cut circles using a cutter about 3 1/2 inches in diameter. 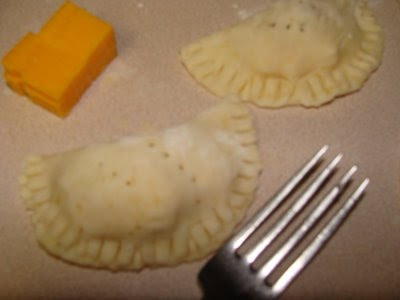 Place 1 piece cheddar cheese on one side of each circle. Top with about 1 tablespoon of meat filling. 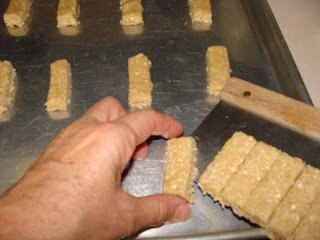 Fold in half and crimp edges together using a fork. Prick the tops with your fork to let the steam out when they bake. Place on baking sheets and bake at 375 degrees C for about 15-20 minutes or until lightly browned. Serve to the kids with ketchup for dipping or to the adults with red pepper jelly. 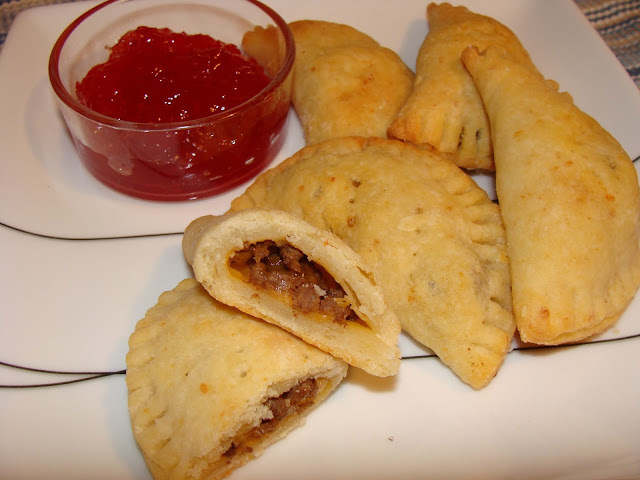 Keep the Chili Meat pockets in the fridge or freezer until serving. They heat up best in a 350 degree oven for about 10 minutes or turn the oven off and let them warm if frozen. My niece, Pauline, made these for a shower a number of years back and I was very happy to scribble down the recipe. These little pizza wedges also go over well as appetizers or a quick lunch. They are so simple to make, but very tasty. Sprinkle 1/3 cup feta cheese on each crust. Mix peppers, zucchini and dressing. Spoon over cheese, dividing evenly. Bake at 425 F, 10 minutes. Cut into wedges. If you are looking for a nice gooey, caramel-filled chocolate cookie, this is the recipe for you. They've been a Christmas favorite at our place for some years, since the time my sister was employed at Nestle Canada and had access to Rolos in abundance! Now it seems I'm always on a mad hunt for Rolos just before Christmas. This year I found them at the third store I visited, but they were all out of the regular Rolos, and had only the jumbo sized or a bag of minis. I used Rolo minis this year and they worked great! The cookies are a wee bit smaller, but nicer for the Christmas trays. Cream 1 cup butter together with the brown and white sugar until light and fluffy. Add vanilla and eggs...beat well. Add flour, cocoa, and baking soda. Stir in a half cup of the chopped pecans. In a separate bowl, combine 1/2 cup chopped pecans with 1 tablespoon sugar. With floured hands, wrap 1 tablespoon of dough around a Rolo, covering completely. Press one side of dough/ball into pecan sugar mixture. Place, nutty side up, 2 inches apart on ungreased cookie sheets. Bake at 375 degrees for 7-10 minutes, or until set and slightly cracked. Cool two minutes; remove from pans. 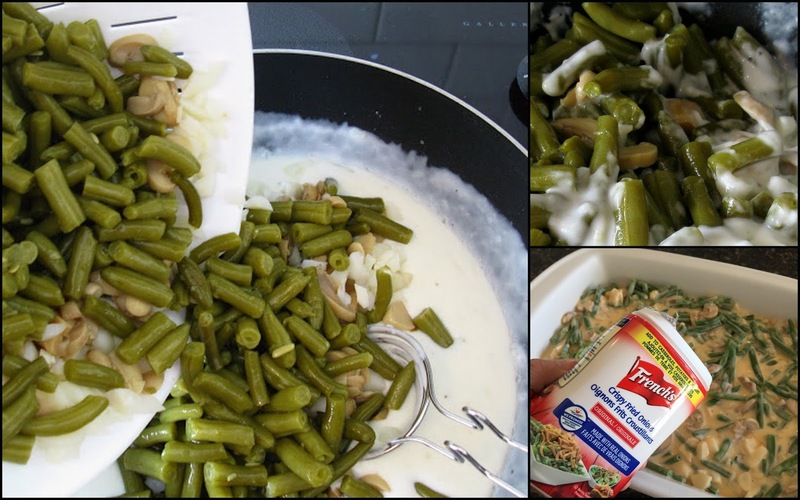 Some of you may recognize this German Recipe. This recipe could also be referred to as Linzer Cookies. These cookies were part of a Christmas exchange, years ago from my Tanta Gertraut. My husband dived in for this gift and he finally won the gift exchange with a happy smile on his face. My aunt passed this recipe down to one of my sister in law's and she has taken the time to walk me through the steps. I now have the recipe, the utensils, and actually made them last night. Guess who had to come and help put the jam between the layers? Sift these three ingredients together in a bowl. Make a hole in the middle of the flour mixture and slowly add grated butter, and mix well. Knead the flour mixture and ingredients till you have a smooth dough. Divide into two portions. Refrigerate for several hours. It's important to have the dough chilled, as it is much easier to work with. On a floured surface roll out the first batch of dough until is is very thin, less than 1/4-inch. 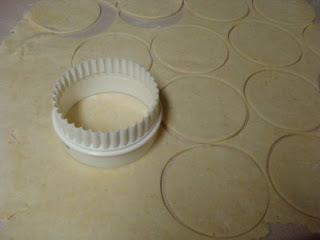 Use the round base cutter for the first batch. These will be the cookie bottoms. Keep the other batch in the fridge while cutting. Remove the second batch of dough from fridge. 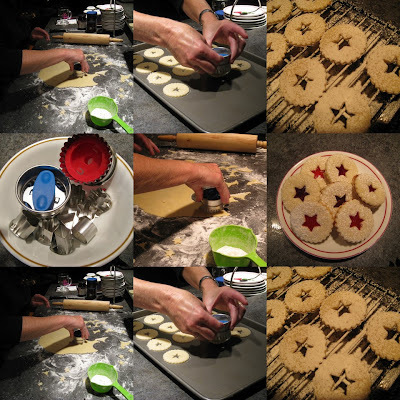 Roll out and use your favorite cutter to make the designs for the cookie tops. Bake at 375° for 4-5 minutes. When cookies are baked and cooled, assemble them, using your favorite jam. Spread about 1 teaspoon of jam on the base. Cover with a top cookie to create a sandwich effect. Freeze. Just before serving, give the cookies a light dusting of icing sugar. Tip: Raspberry jam is our favorite filling. Linzer cookie cutters are available at a delicatessen and come with a base and several interchangeable cutout designs. When they are completed, freeze them and just before serving, dust them with a bit of powdered sugar. They taste the best straight out of the freezer. Yes, they take time but they are worth it. 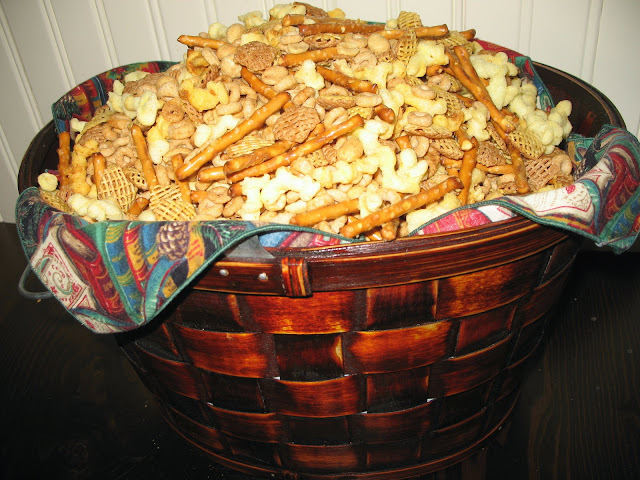 A favorite holiday staple at our place is this tasty snack mix, which we call nuts 'n bolts, but which is known by many other names. Here's a somewhat zippy version. Feel free to use the cereals and munchies of your choice. We love adding the Old Dutch popcorn twists but if you aren't Canadian, you won't be finding those on your grocery store shelves. Mix together the cereal, popcorn and nuts in a large roasting pan. Melt butter and add seasonings and Worcestershire sauce. Drizzle over cereal mixture and stir well to coat. Bake at 200° F for 2 hours, stirring every ½ hour. 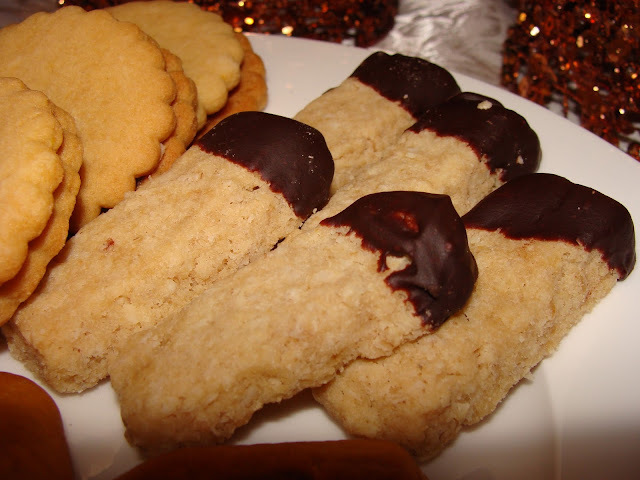 Here is a shortbread that's a little different than most. that our ladies Bible study group put together back in 1980. I've been making them every Christmas since. Mix dry ingredients and work in butter as you would for regular shortbread. Do not over mix. Dough will be slightly sticky. Pat or roll out on lightly floured surface into a rectangle about 1/4 inch thick. Using your handy dandy bench scraper, mark dough into sections and cut into logs about 1/2 inch by 2 inches. Using bench scraper or metal spatula, transfer to ungreased cookie sheets. Bake at 275 degrees F for about 20 minutes or until cookies are set. Remove from oven and let cool. 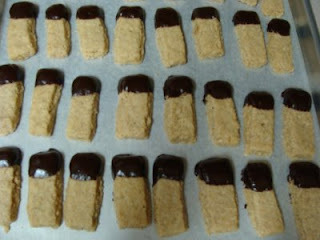 Place on waxed paper and refrigerate until chocolate is set. Another cookie I bake at Christmas time, of course it can be baked at any other time which I do. I have baked this recipe numerous times and it always turns out. I found it at Christmas-cookies.com and after the first time I tried it it was marked as a winner! I've changed up the recipe a wee bit. Preheat oven to 350 º. Grease 2 cookie sheets or line with parchment paper. In a medium sized bowl cream together butter and sugar. Beat in eggs and stir in vanilla. Combine flour, baking powder, salt and stir into creamed mixture. Fold in chocolate chips, toffee bits and pecans. Drop by tablespoons on cookie sheets. Bake for 10 to 12 minutes till slightly golden in color. I found that I had to bake them a bit longer in my oven. Cool on baking sheet 5 minutes before removing to cool completely on rack. 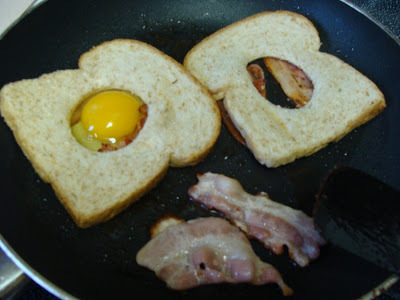 This way of doing bacon and eggs originates from the year I met my husband. That summer, I was a counselor at Columbia Bible Camp (now Stillwood Camp) here in BC. We took our girls on an overnight hike and made these for breakfast - fried up on the bottom of one of those large juice cans tipped over a fire. It's much easier to make them in a frying pan! and you only need one pan. Wranglers are now a family favourite and hardly a week goes by without making them at least once or twice for breakfast or for a quick lunch. 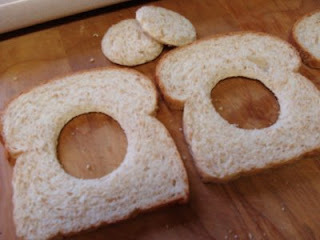 Cut a circle out of the middle of the bread slice. Cut strip of bacon in half. Place bacon halves side by side in frying pan and fry until brown. 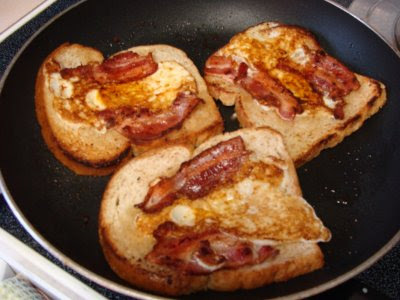 Turn bacon pieces over and lay bread over the bacon. Crack egg into the hole and sprinkle with salt and pepper.Turn heat down and cook until egg white begins to turn cloudy. You can cover the pan if you like. Flip the wrangler over and continue to cook uncovered until desired doneness. Voilá - bacon eggs and toast and only 1 pan to wash. This recipe was given to me by Doris, who became my friend because we lived in the same neighborhood and our kids became Kindergarten friends. Now, our grown children are all over the map (literally) but we are still walking regularly and solving the world's problems. A friend like this, who knows everything about you and remains, is a true gift. Beat cheese and mayo until smooth. Stir in next 5 ingredients. Cover and chill several hours. Form into two balls - will be quite sticky, but as you roll it in the nuts, to cover, you can shape it. I like having several of these in the freezer at this time of the year, since they are no work on the day that you need to pull one out. Update: This cheese ball is a great addition to a charcuterie board ... along with crackers, crusty baguette, salami, prosciutto, sweet and/or savory spreads, cheeses, gherkins, dried fruit, nuts, grapes, the variety is endless. A very easy gift to make and a 'crowd pleaser' too. So easy to make that it can be done as a last minute gift! Years ago I got this recipe from a friend who called it Crispix Snacks but on the Crispix cereal box it's called Snow Drops and that just sounded better to me. I changed up the recipe a tiny bit. Melt chocolate chips and peanut butter in a saucepan on the stove or in a bowl in the microwave. Stir until melted and smooth. Pour Crispix cereal in a large bowl and pour the chocolate and peanut butter mixture over the cereal stirring gently until all the cereal is coated. Pour icing sugar in a large paper bag and add the coated cereal. Keep the top of the bag closed and shake up the cereal until it is well coated. Pour on to a large baking pan and place in a cool place to harden. 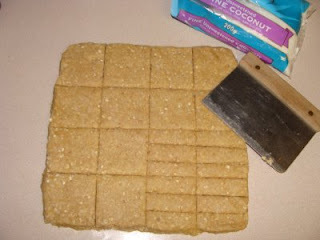 Once cool it is ready to package or to have as snacks. I first began to enjoy this delectably flavoured and scented chicken when the invitations to my inlaws-to-be began. 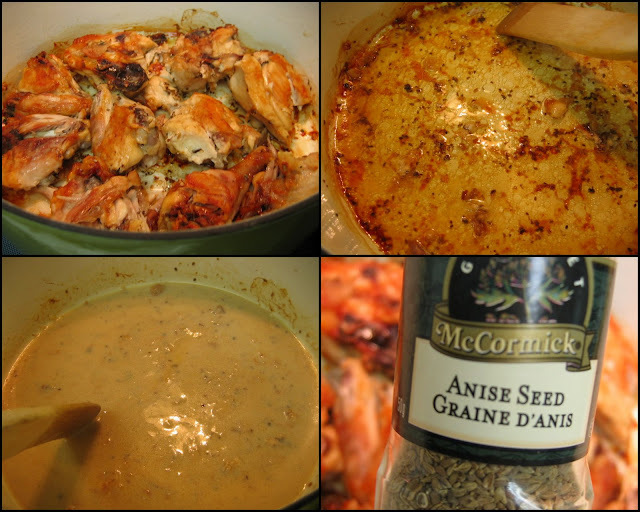 I began to make in immediately upon marriage as it is . . .truly one of the easiest chicken dishes to make. It can be made with a younger chicken, purchased already cut up, or you can buy a roasting chicken, and cut it up yourself. The reason to cut it up is so that all the parts have equal "roastablity" against the roasting dish. I made this the other day. . .and Stuart still remembers saying as a young boy. . . how much he liked it. The wonderful aroma in the kitchen can be smelled outside and the flavour is truly delicious. I'm sure that every good Mennonite woman has her own way of making this and I'd love to know how you do it. Cut up your chicken if it isn't already. Arrange it in a single layer in a heavy pot or roasting pan. Sprinkle with salt as you would any roast chicken. Sprinkle with anise seed. I never measure but I would say several teaspoons. Put the lid on and bake in the oven at 325 for 2 1/2 hours. Half way in between, I turn it over to give the skin side a good caramelizing. Remove the chicken to a serving plate and cover with foil to stay warm. Sprinkle a tablespoon of flour into the pot with the drippings. Stir on medium heat until bubbly. Add 1 cup of milk and continue to stir until bubbly. Add more milk to make the consistency that you enjoy for sauce. Serve with roasted potatoes or mashed potatoes.